Arsenal were held to a 1-1 draw by a resilient Brighton side as the Gunners lost ground on the sides above them in the race for the top four. Having lost here at the back-end of last season, Unai Emery's side got off to the best possible start to avenge their demons, when Pierre-Emerick Aubameyang's instinctive curling strike found the top corner of the net inside seven minutes. 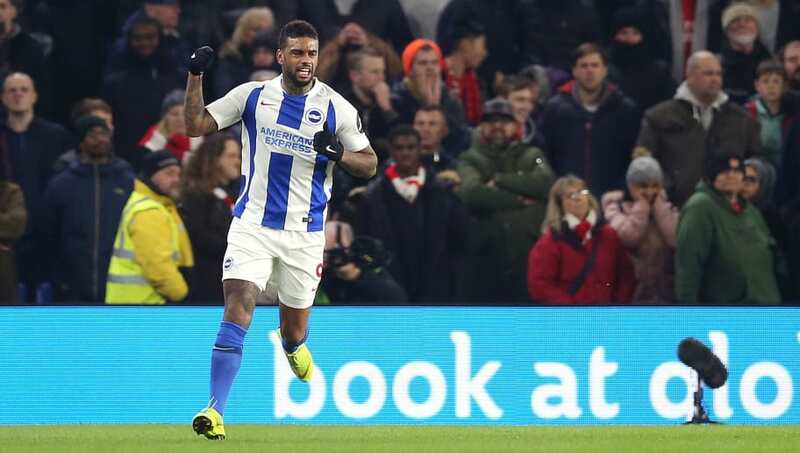 Arsenal's lack of ruthlessness in front of goal cost them however, when from their own corner, a Brighton counter saw Jurgen Locadia round goalkeeper Bernd Leno and slot home to level things up. The home side's goal seemed to galvanise them, and created a greater sense of urgency in their play in the second half. With Arsenal throwing everything at Brighton to find a winner, the hosts stood impressively firm and in the end were well worth their point. Coming off the back of three successive defeats in the ​Premier League, Chris Hughton's side were always going to face an uphill task to earn any kind of positive result against a rejuvenated Arsenal side. But in a display of real spirit and desire, the Seagulls were rewarded with a hard-fought point against a strong Arsenal side. Starting XI: Ryan (7); Montoya (7), Duffy (8*), Balogun (6), Bernardo (7); March (6), Stephens (8), Propper (7), Locadia (8); Groß (6), Murray(7). STAR MAN - With centre-back partner Lewis Dunk ruled out due to his sending-off in ​Brighton's last game, Shane Duffy's own return from a three-match suspension was more than welcome for the Seagulls. In an imperious performance, the giant central defender dominated Arsenal's strikers with real aggression and strength. He marshalled both Alexandre Lacazette and Aubameyang well and was a real leader in his side's backline. WORST PLAYER - In a really strong team performance, picking a 'worst player' would be slightly harsh on Brighton. Solly March was perhaps the worst of the best, and on certain occasions let his teammates down on promising counter-attacks with his inconsistent crossing. With a huge game against an unbeaten Liverpool on the horizon, the biggest issue coming into the game was about Emery's team selection. With both Lucas Torreira and Matteo Guendouzi a yellow card away from suspension, and already several injuries to contend with, there was much debate about the kind of side the ​Arsenal manager would put out. In the end, Emery's decision of putting his strongest team out went unrewarded. After Aubameyang's early goal threatened to open the floodgates, Arsenal lost their momentum and way with Locadia's surprise equaliser. With the sides above them winning, the Gunners' draw must have felt like a defeat for Emery. Starting XI: Leno (5); Lichtsteiner (5), Sokratis (6), Koscielny (6), Kolasinac (6); Torreira (6), Xhaka (6), Guendouzi (6); Ozil (4), Aubameyang (7), Lacazette (6). STAR MAN - The Premier League's top goalscorer, Pierre-Emerick Aubameyang once again found himself on the scoresheet. In a dominant early period, the Gabon international was electric and had two great chances either side of his goal. With 13 to his name in the league, Aubameyang's goals will be crucial to where Arsenal end up this season. WORST PLAYER - If ​Mesut Ozil has any intention of staying at Arsenal in the long-term, then the kind of performance at the Amex is not going to do him any favours. The German was so un-influential in the opening period that he was subbed at half-time by Emery in favour of Alex Iwobi. With his manager insisting on a strong work ethic off the ball, it's hard to see the former Real Madrid star at the Emirates next season. Brighton take on Everton on Saturday in the second of their two consecutive home games, and will be hoping that the draw against the Gunners can kick-start a run of good form.